Background: Hypoxia can alter the Pharmacokinetic (PK) characteristics of drugs, thereby affecting drug absorption, distribution, metabolism, and excretion. Environmental characteristics at high altitude include but are not limited to hypobaric hypoxia, low temperature, high solar radiation, and arid climate, all of which can adversely affect normal bodily functions. Therefore, it is important to study the pharmacokinetic changes of drugs at high altitude. Method: A systematic review of published studies was carried out to investigate the effects of hypoxia on the metabolic characteristics of some drugs and the activity and expression of drug-metabolizing enzymes in high-altitude hypoxic environments, and discussed the relevant mechanisms. Results: The metabolism of most drugs decreases in high-altitude hypoxia, whereas Mean Residence Time (MRT), Half Time (T1/2), and Area Under the Curve (AUC) increase and Clearance (CL) decrease in this environment. The effect of hypoxia on CYP450 enzymes in animals is still a subject of debate. 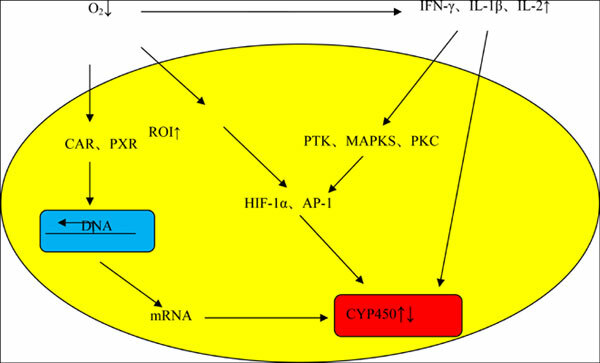 With the exception of CYP2C11 and CYP2C22, the widespread belief is that high-altitude hypoxia decreased the activity and expression of CYP1A1, CYP1A2, CYP2E1, and CYP3A1, and increased those of CYP3A6 and CYP2D1 in rats. The changes in the activity and expression of drug metabolizing enzymes are consistent with the changes in pharmacokinetics of some enzyme substrates in the high-altitude hypoxia environment. Conclusion: The findings of this review have indicated that hypoxia may play a key role in the PK changes of drugs at high altitude. It is suggested that patient living at or traveling to high altitude should be closely monitored, and the dosages of some drugs metabolized should be reduced. Keywords: High altitude, hypoxia, pharmacokinetics, drug metabolism, drug-metabolizing enzyme, mechanism. Keywords:High altitude, hypoxia, pharmacokinetics, drug metabolism, drug-metabolizing enzyme, mechanism. Abstract:Background: Hypoxia can alter the Pharmacokinetic (PK) characteristics of drugs, thereby affecting drug absorption, distribution, metabolism, and excretion. Environmental characteristics at high altitude include but are not limited to hypobaric hypoxia, low temperature, high solar radiation, and arid climate, all of which can adversely affect normal bodily functions. Therefore, it is important to study the pharmacokinetic changes of drugs at high altitude.